Cesky Sternberk Castle is one of the best preserved medieval castles in the Czech Republic. The medieval castle is situated on a high rock above the river Sázava, in a small picturesque village of the same name. Cesky Sternberk Castle is located about 45 km southeast of Prague, in the region of Central Bohemia. Dubbed the "Pearl of Posázaví”, after the romantic poet Posozavi, in the area around the river, the Cesky Sternberk Castle was built in 1241 by Zdeslav of Divišov. The name literally means "castle star”, which corresponds with the emblem of the aristocratic family, which depicts weapons and eight stars. It is remarkable that to this day Cesky Sternberk Castle belongs to those who built it - Zdeslav of Sternberk. Later the castle passed into foreign hands, but finally returned to the family Sternberk in 1841. Remained in their hands until 1949, when Cesky Sternberk is "nationalized" by the communist government of Czechoslovakia. Amazingly, it’s owners moved to a small apartment in Prague, but agreed to work as guides in their own castle. In 1992 with the fall of regimes Sternberk castle was returned to the family. Today it is owned by Earl Zdeněk Sternberk. The early Gothic medieval castle is the basis of the current structure of the castle, which in turn is the result of reconstruction and expansion in different centuries. Today Cesky Sternberk Castle has strict facade of a medieval castle in the Gothic style, but the interior of the palace is extravagant and in the spirit of the early Baroque. Cesky Sternberk Castle is considered one of the best preserved Bohemian Gothic palaces. It is open for public visits, the tour passes through fifteen richly furnished rooms. Visitors are translated in the vast to the richly appointed Knight's Hall where you can see many historical objects and values. Then required to place an order in Czech Sternberk, is beautifully painted chapel St. Sebastian, from there to the Yellow House with its baroque decorations and furniture from Louis XVI. The huge dining room of Cesky Sternberk Castle is marked by the portraits of important family members. The following generously decorated and furnished rooms paid visitors in 4 different styles - rococo, Biedermeier, imperial baroque style. There is a hunting room and everything else that is worth to be seen in Cesky Sternberk. Cesky Sternberk Castle is located about 45 km southeast of Prague. If traveling by car, follow the highway D1 and get off of it at Exit 41. There is an opportunity to catch a bus from both Prague and from Benešov. But a pretty good option is to upload the train stops at the Čerčany (which is, again, reached from Prague and Benesov), which will give you a nice trip among the picturesque scenery. 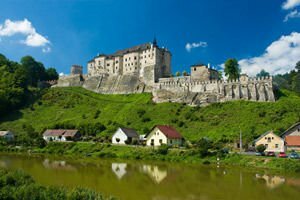 Journey to the Cesky Sternberk Castle takes passengers along the beautiful valley of the river Sazava, lasts about 2 hours, and is definitely worth it.